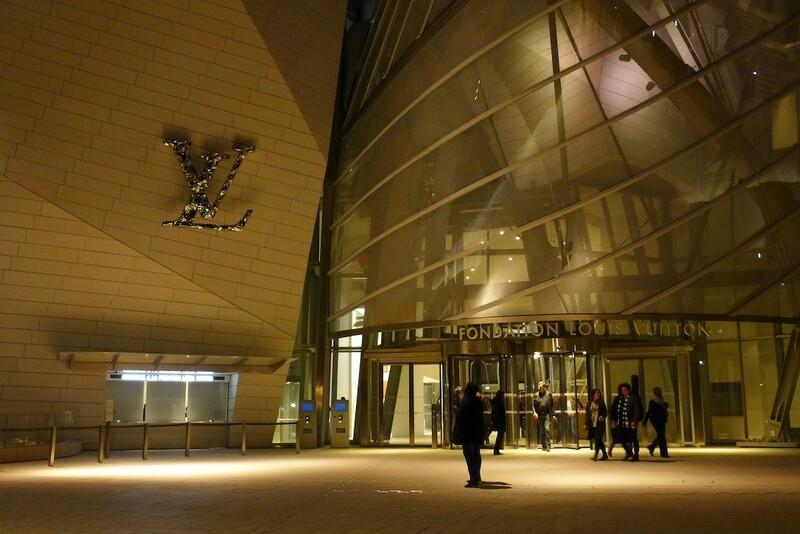 The Fondation Louis Vuitton (FLV) was inaugurated on 27 October 2014. Located in the Bois de Boulogne on the west side of Paris it is in my opinion THE place to be seen during a visit in Paris. I went there three days after its inauguration. The closest metro station is Les Sablons on metro line 1 (between the Place de l’Etoile and the business district of la Défense) and from there the ten-minute walk through Neuilly and the Bois de Boulogne is really easy thanks to numerous road signs for pedestrians. 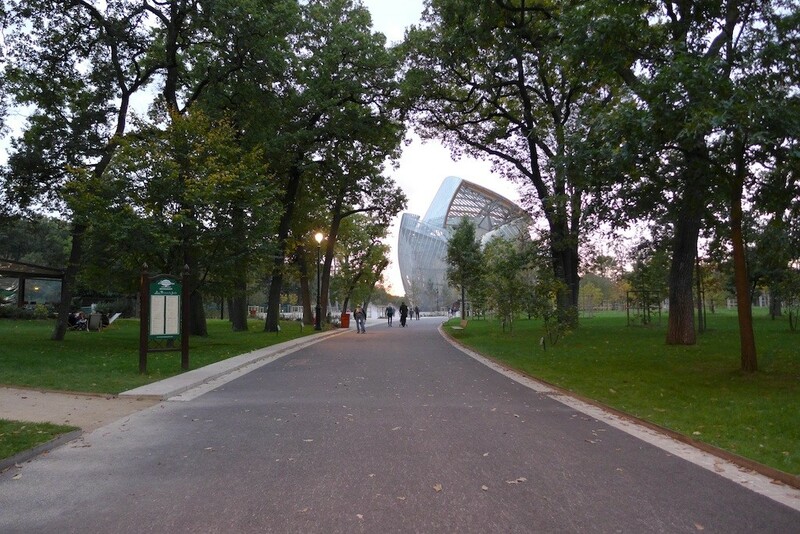 I had bought my ticket in advance on the website of the Fondation and this way I was able to cross the Jardin d’acclimatation in order to reach the building. Indeed the entrance ticket to the Fondation includes the entrance to the Jardin d’acclimatation. After a short walk the view of the building emerging from the trees is purely and simply magical ! The FLV was designed by the American architect Frank Gehry and is an outstanding example of “non-standard” architecture. It fits extremely well into the site chosen and is composed of twelve glass sails which are all different. Does it look like a boat ? A bird ? A vessel ? Everyone has got his own opinion. 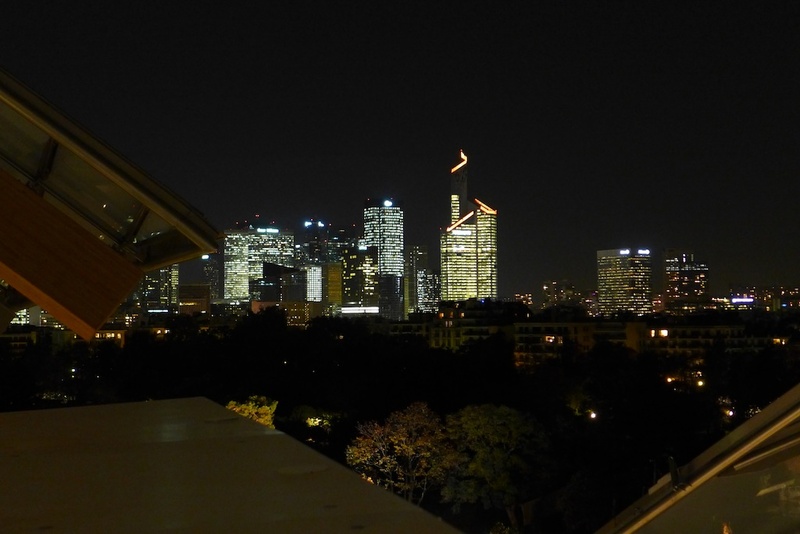 And the look of the building is never the same and changes radically according to the viewing angle. I really recommend to go around the building either before or after your visit. The works from the permanent collection exhibited in the museum change regularly and so do the temporary exhibitions. If you like to know in advance what you are going to see, have a close look at the website of the Fondation when you book your ticket online before your visit. But you can also prefer to be surprised and to discover the works and artists exhibited only once you get there : this is what I did… and I had no regrets as in such a place the beauty of any art work is emphasized and one cannot be disappointed. 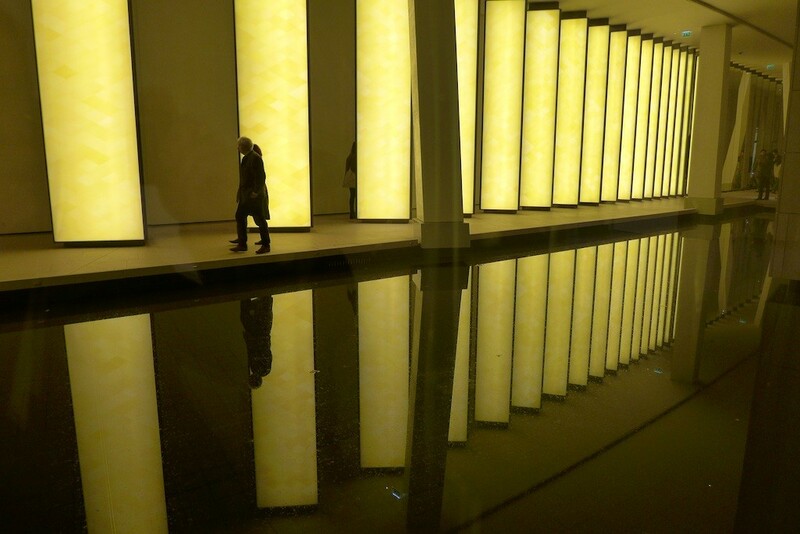 On the basement stands one of the most exceptional works of the building, which is a permanent work : the Grotto, by Olafur Eliasson. It is composed of fourty-three prism-shaped columns which are all illuminated from the inside and covered with mirrors on two of their sides. 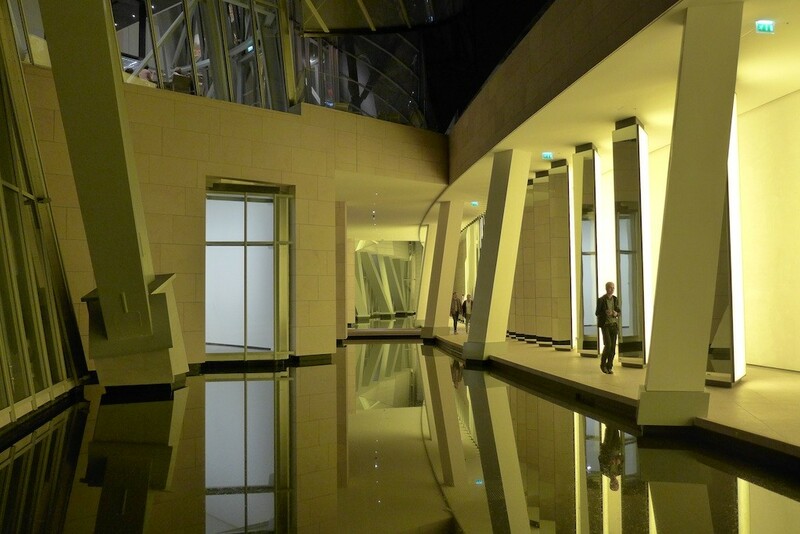 Walking amongst those columns is simply magical as it activates an endless interplay of reflections. I spent more than half an hour strolling about the Grotto. During my visit in October I was rather fond of the works of two artists : The film A journey that wasn’t 2005, by the French artist Pierre Huygue. 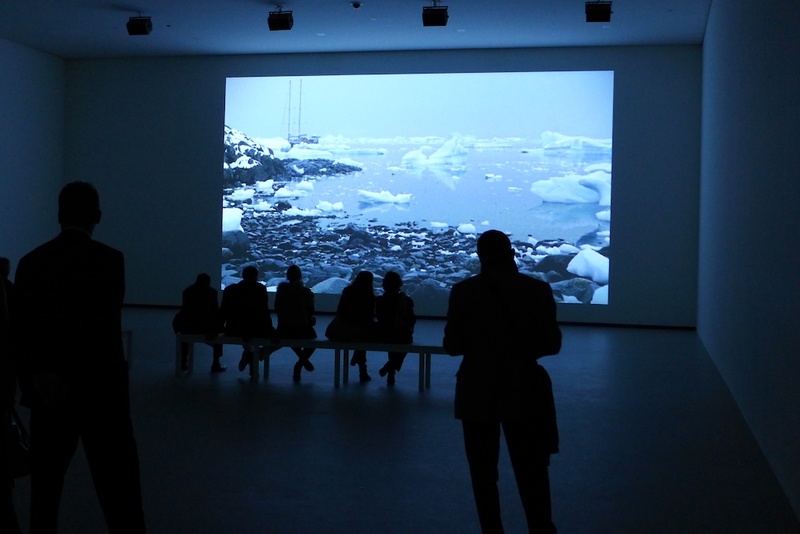 It tells the story of how an expedition to Antartica gave rise to a score performed by a symphonic orchestra on the ice rink in Central Park ; and the works of Gerhard Richter, mixing photography and painting, especially the Strips. Both were temporarily exhibited. 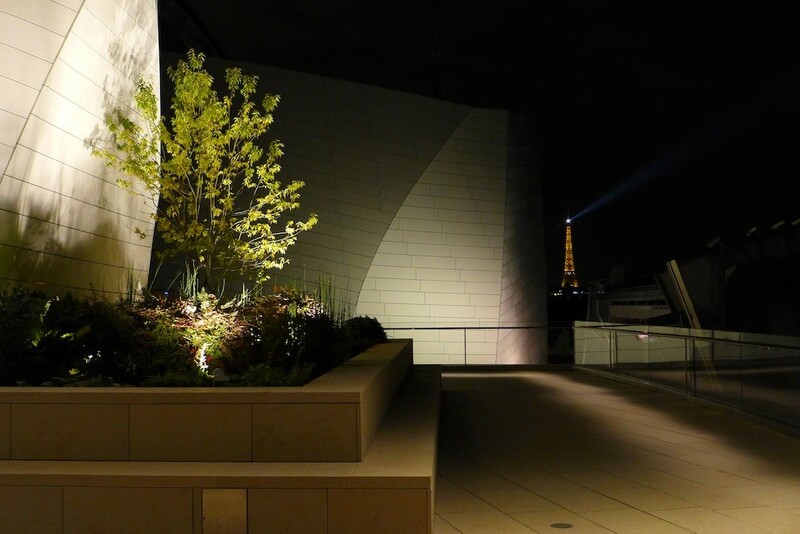 On the top floors of the Fondation the two levels of terraces are really charming with their nooks, their flowers and trees, and above they offer amazing views on the business district of La Défense or on Paris… including the Eiffel Tower in the background. 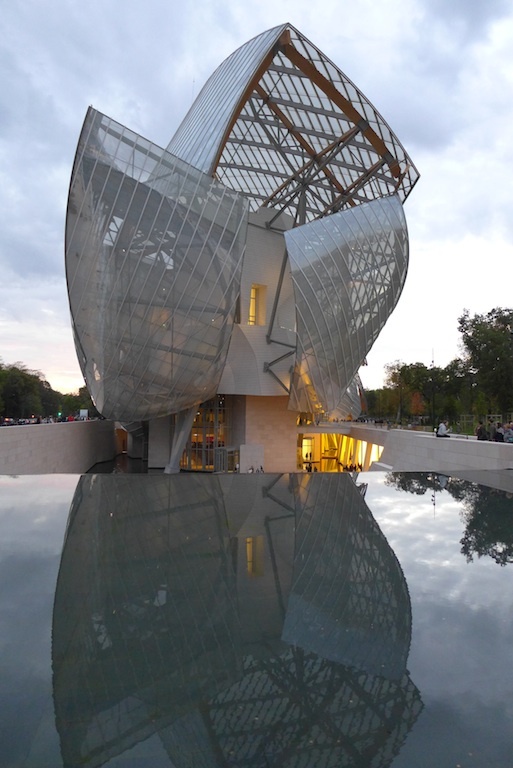 It was the third time that I visited a museum designed by Frank Gehry and dedicated to modern art : the other two were the Guggenheim Museum in Bilbao and the AGO in Toronto. Each time I got the same feeling : the design of the building itself, outside but also inside, sublimates the works which are exhibited there. 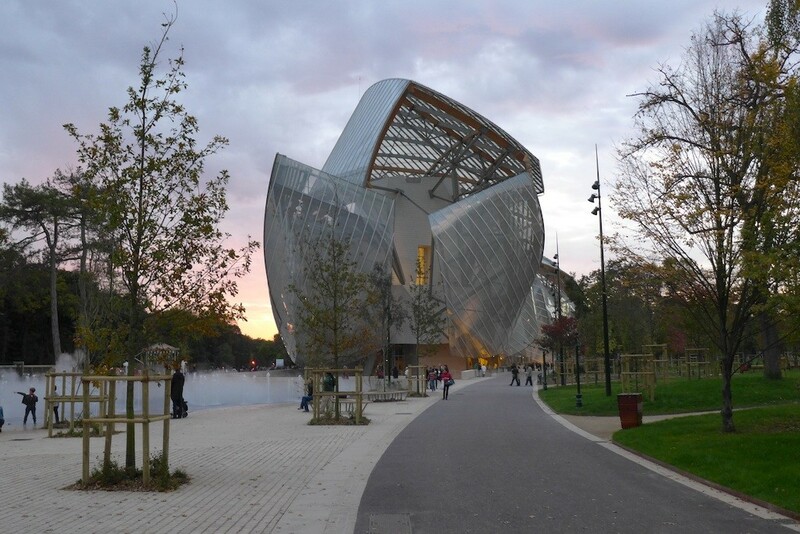 That is the reason why I think that the Fondation Louis Vuitton is really a must-visit museum in Paris, for its amazing architecture and for the beauty of the works exhibited, not only their intrinsic beauty but also the beauty that the building itself confers on them. Previous Previous post: BHV Marais : So Colourful, So Trendy, … So Parisian !